You have reached the official website of The Brooklyn Jazz Orchestra (BJO). The BJO is a large jazz ensemble firmly rooted in the jazz tradition while also keeping an eye toward the future of creative music. The band’s repertoire includes music from Duke Ellington, Stan Kenton, Count Basie, Thad Jones, Gerry Mulligan, and many others. The BJO also commissions new music and arrangements from today’s leading composers. 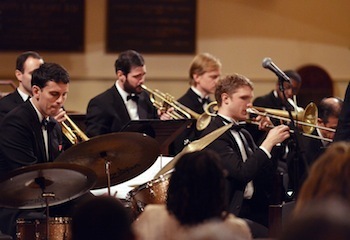 Brooklyn Jazz Orchestra concertgoers can expect a fantastic performance of exciting music.